Research shows that children who learn to read well have greater success in school – and it’s never too soon to start the process. Holding your baby on your lap and reading out loud to her actually helps to build her brain. 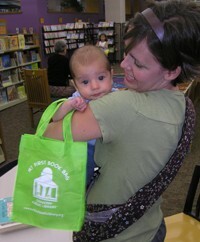 And bringing your baby to the library to experience the books and programs we offer nurtures a love of reading and builds a foundation for learning. Let us help you help your child become a reader for life!